Pastor Darrell holds a B.A. in Theology from Beacon University Institute of Ministry. Darrell has served in Free Spirit Community Church as Music Minister, Youth Pastor, and the Assistant Pastor. On June 3rd of 2017 Darrell was Ordained to the office of Senior Pastor. Succeeding his father, Bishop James Kelly, Pastor Darrell has received a new mantle for ministry. Pastor Darrell has appeared on the Trinity Broadcast Network "Praise the Lord" Broadcast with host Clifton Davis. Pastor Darrell has also been featured on TBN's Church Praise, TBN Special Moments, ATLANTA LIVE, and has been a repeated guest on Dr. Bobby Jones Presents. Pastor Darrell is a gospel recording artist having released several independent albums and has shared the stage with some of the most renown names in Gospel Music. 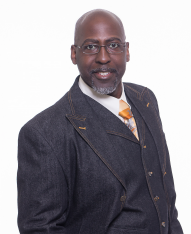 Darrell is also a published author and founder of Inspired Life Publishers. Not only impacting the world, but being an impact at home...Pastor Darrell is the loving husband of Angela Kelly and proud father of Zuri Kelly (daughter).